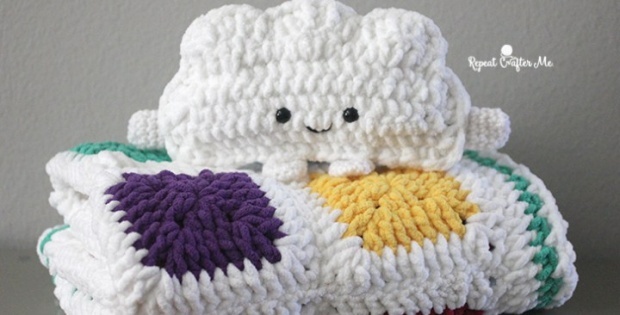 This beautiful crochet bulky baby blanket is the perfect companion to the Crochet Cuddly Cloud.we have featured previously. This gorgeous bulky crocheted baby blanket has been designed by Sarah over at Repeat Crafter Me. She has crocheted it in the lovely Bernat Baby Blanket Yarn. The lovely baby blanket has been made from 20 crocheted squares. These have then been sewn together using the mattress stitch. You can find there tutorial here: Mattress Stitch Tutorial. Once completed, the crocheted blanket should measure approx. 34 inches long by 28 inches wide. In metric, that is just over 86 cm in length and just over 71 cm in width.